St. Thomas Airport announced its’ new nonstop flight to Orlando. A water salute and red carpet welcomed the inaugural flight Thursday November 8. It is a new nonstop service with Spirit Airlines. Governor Mapp, Lt. Governor Potter and members of the tourism department greeted guests as they arrived. 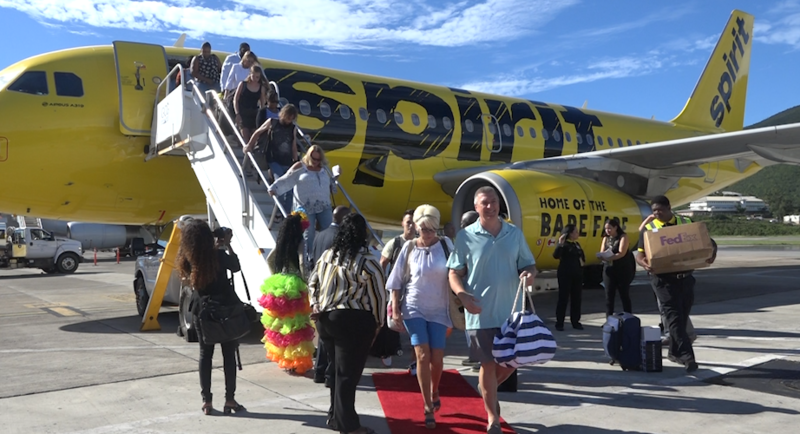 They also cut a yellow Spirit Airlines ribbon. Spirit’s spokesperson said the flight will leave Thursday, Sunday and Tuesday but hope to increase depending on the demand. The flight would arrive into St. Thomas at 3:00 PM E.T. “Spirit’s so excited to add this new daily non-stop to Orlando we’ve been serving Fort. Lauderdale for ten years and we’ve been working on this plan for quite a while. We’ve just started service to St. Croix from Fort Lauderdale in May and the growth in the Caribbean is here. We know that there’s a lot of islanders in the Florida area, central Florida and south Florida who want to visit family and friends they want to go see the theme parks and vice versa. People are really looking to get that perfect getaway to the islands here to the US Virgin Islands,” Stephen Schuler a Spirit Airlines Spokesperson said. Spirit spokesperson told us the prices are based on the demand so it is hard to highlight the average price. They note dates around Paradise Jam, Thanksgiving and Christmas can be higher than typical due to the travel demand.